Tapirus terrestris, the lowland or Brazilian tapir, has the widest distribution of the four living species of tapirs. It ranges from Colombia to northern Argentina, and from the foothills of the Andes on the west to the Atlantic Ocean of South America on the east, where it generally inhabits moist forested areas in the South American lowlands. The lowland tapir is possibly sympatric, or historically sympatric, with populations of the endangered mountain tapir (T. pinchaque) along the eastern slope of the Andes in Ecuador and Colombia. It is also potentially sympatric with reputed southern populations of Baird's or Central American tapir (Tapirus bairdii), in northern Colombia, although these distributional data are scanty. The fourth extant tapir species is the Asian or Malayan tapir (T. indicus) which lives in the tropics of southeast Asia. 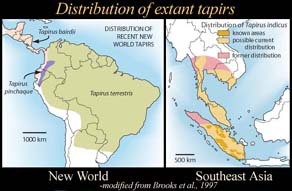 Phylogenetic analyses suggest that the New World tapirs are more closely related to one another than they are to the Asian tapir, and that T. terrestris is most closely related to T. pinchaque (Norman and Ashley, 2000). Tapirs are browsers, and their cheek teeth are adapted to form a series of shearing transverse blades (lophs) that are well suited for chewing fruit, leaves, and twigs. Tapirs generally live in forested areas, and their stocky build, with relatively short limbs and stout torso, is well suited for barreling through the underbrush. They have four toes on their front feet, and three on their hind foot. They are moderately large mammals, with adult lowland tapirs weighing around 150-250 kg (330 -550 lbs). 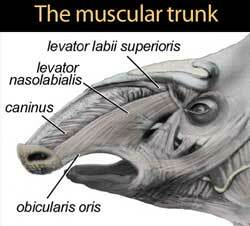 Perhaps the most peculiar feature of tapir anatomy is a muscular prehensile trunk that is used in foraging. The tapir's prehensile trunk is associated with modifications in their skull. These modifications include an extremely retracted narial incision (or nasoincisive incisure), a condition that has been used to infer the presence of a trunk in fossil tapirs. Relative to other living perissodactyls (i.e., horses and rhinoceroses), tapirs are also characterized by a posteriorly telescoped cranium, with the frontal bones elevated and posteriorly displaced relative to the rest of the facial skeleton. Tapirus terrestris is distinguished from other Recent tapir species by its enlarged sagittal crest, which appears to be related to a changed timing for expression of the temporalis musculature during the early stages of development (Holbrook, 2002). Trunk muscles (modified from Witmer et al. (1999). Skull architecture reflects trunk's presence. Although the general external cranial osteology of Tapirus is fairly well documented compared to most mammalian taxa (e.g., Hatcher, 1896; Hershkovitz, 1954; Parker, 1882; Radinsky, 1965a; Simpson, 1945), only two studies (Paulli, 1900; Witmer et al, 1999) touch on aspects of its internal cranial architecture (the reader is referred to the Witmer et al. paper for a beautiful description of the anatomy of the tapir's proboscis). As with many mammals, there are actually more investigations about the cranial osteology of fossil tapirs than there are for the extant species (e.g., Lundelius and Slaughter, 1976; Radinsky 1963, 1965a, 1965b; Reshetov, 1975, 1979; Simpson, 1945, to name a few). 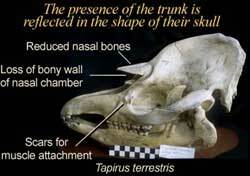 The imagery presented here was gathered to further knowledge of the internal cranial osteology of Tapirus terrestris, based on non-destructive, non-invasive, X-ray computed tomographic (CT) techniques. The specimen TMM M-16 is a complete skeleton of Tapirus terrestris. Unfortunately there is little data surrounding the provenance of this individual, except that it was donated to the University of Texas by the San Antonio Zoo, probably in the 1930s. It is unknown whether this animal was wild caught or captive bred. The specimen is missing its right I2 and its left i3. The tips of the coronoid processes of the dentaries are broken. 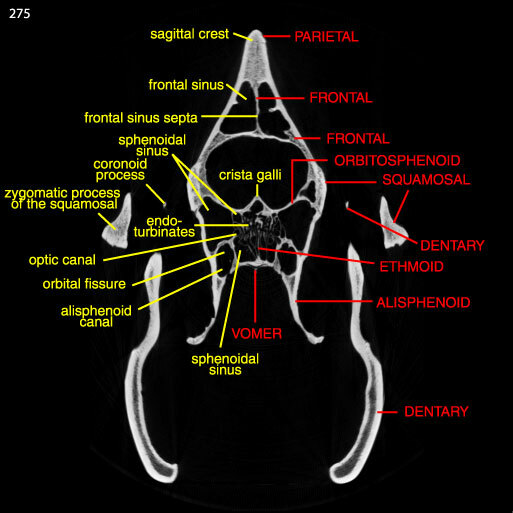 The pterygoid hamulae are missing, as are the tympanics. The right nasal is broken along its descending process and is pushed down. The relative maturity of TMM M-16 is indicated by incomplete eruption of the upper and lower third molars, all of which are almost completely encased within their crypts, and completely unworn. All epiphyses in the postcranial skeleton are completely fused. The left and right innominate bones are not fused together. The skull was scanned by Cambria Denison and Richard Ketcham in September 1997 along the coronal axis for a total of 412 slices, each slice 1.0 mm thick, with a 1.0 mm interslice spacing. The animations displayed were reduced from the original for optimal Web delivery. See the inspeCTor for unreduced CT data. A labeled sample slice through the braincase illustrates the detail discernible in the unreduced CT data. Hershkovitz, P. 1954. Mammals of northern Colombia, preliminary report no. 7: tapirs (genus Tapirus), with a systematic review of American species. Proceedings of the United States National Museum 103:465-496. Holbrook, L. T. 2002. 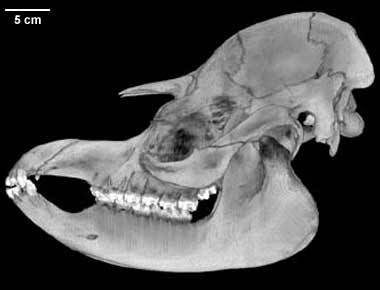 The unusual development of the sagittal crest in the Brazilian tapir (Tapirus terrestris. Journal of Zoology 256: 215-219. Lundelius, E. L., Jr., and B. H. Slaughter. 1976. Notes on American Pleistocene tapirs: in Essays in Palaeontology in Honour of Loris Shano Russell. C. S.Churcher (ed. ), R. O. M. Misc. Publ. Athlon, p. 226-243. Click on the thumbnail to the left for an endocast animation of the sinuses, brain, and ear region. 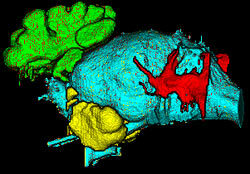 The frontal sinus cast is shown in green, the sphenoidal sinus cast in yellow, the temporal meatus cast in red, and the brain endocast in blue. To cite this page: Dr. Matthew Colbert, 2002, "Tapirus terrestris" (On-line), Digital Morphology. Accessed April 19, 2019 at http://digimorph.org/specimens/Tapirus_terrestris/.